Since joining the Department of Geosciences in September 2006, Dr. Khalid has successfully led many interdisciplinary collaborative projects funded by KFUPM, KACST, and Saudi Aramco. These projects have allowed us to network with colleagues from prestigious international universities (Stanford, Tennessee, Leeds, Cardiff, Copenhagen, Milan) and from oil companies. Ph.D. in Geology, Uppsala University, Uppsala, Sweden, 2002-2006. M.Sc. in Geology, KFUPM, Dhahran. Saudi Arabia, 1999-2001. B.Sc. (Honors) in Geology, KFUPM, Dhahran, Saudi Arabia, 1993-1998. Sedimentology and impact of diagenesis on reservoir quality of deep-sea turbidites. Stratigraphy and chronology of dunes in the Rub’Al Khali, Saudi Arabia. Modern depositional shallow marine environments. Al-Ramadan, K., Morad, S., Jean-Noel, P., and Al-Aasm, I., (2005). Distribution of Diagenetic Alterations in Siliciclastic Shoreface Deposits Within Sequence Stratigraphic Framework: Evidence From The Upper Jurassic, Boulonnais, NW France. Journal of Sedimentary Research, v. 75, p. 943-959. Warren W. Wood, Richard M. Bailey, Brian A. Hampton, Thomas F. Kraemer, Zhong Lu, David W. Clark, Rhodri H.R. James, Al-Ramadan, K., (2012). “Rapid late Pleistocene/Holocene uplift and coastal evolution of the southern Arabian (Persian) Gulf”, Quaternary Research, 77, 215–220. Al-Ramadan, K., Dogan, A. U., and Senalp, M., (2013). Sedimentology and Diagenesis of the Miocene Nutaysh Member of the Burqan Formation in the Midyan Area, Northwestern Saudi Arabia. Geological Quarterly, v. 57 (1), p. 165-174. Al-Ramadan, K., Sadoon, M., and Plink, P., (2013). “Distribution of Diagenetic Alterations in Relationship to Depositional Facies and Sequence Stratigraphy of Wave- and Tide-Dominated Siliciclastic Shoreline Complex: Upper Cretaceous Chimney Rock Sandstones, Wyoming and Utah, USA”, International Association of Sedimentologists Special Publication 45: Linking Diagenesis to Sequence Stratigraphy, p. 271-296. Al-Ramadan, K., Morad S., Norton A. K., Hulver, M., (2013). “Linking Diagenesis and Porosity Preservation to Sequence Stratigraphy of Gas Condensate Reservoir Sandstones, the Jauf Formation (Lower to Middle Devonian), Eastern Saudi Arabia”, International Association of Sedimentologists Special Publication 45: Linking Diagenesis to Sequence Stratigraphy, p. 297-335. Al-Ramadan, K., (2014). Illitization of Smectite in Sandstones – The Permian Unayzah Reservoir, Saudi Arabia, Arabian Journal for Science and Engineering, v. 39, p. 407-412. Matysik, M., Al-Ramadan, K., and Riding, R., .(2015). Composition and Morphology of Early Devonian Microbial and Metazoan Patch Reefs: Qasr Member of the Jauf Formation, Northwestern Saudi Arabia, Journal of Sedimentary Research, 85, p. 45-61. Koeshidayatullah, A., Al-Ramadan, K., Collier, R.E.L, and Hughes, G.W. (2016) Variations in Architecture and Cyclicity in Syntectonic Fault-Bounded Carbonate Platforms: Early Miocene Red Sea Rift, NW Saudi Arabia.Marine and Petroleum Geology. 70, p. 77-92. Amao, A. O., Al-Ramadan, K.,& Koeshidayatullah, A. (2016). Automated mineralogical methodology to study carbonate grain microstructure: an example from oncoids. Environmental Earth Sciences, 75(8), 1-11. Koeshidayatullah, A, Chan, SA, Al-Ghamdi, M, Akif, T and Al-Ramadan, K.(2016) Discrimination of inland and coastal dunes in Eastern Saudi Arabia desert system: An approach from particle size and textural parameter variations. Journal of African Earth Sciences. 117, 102-113. Hakami, A., Al-Mubarak, A., Kurison, C., Al-Ramadan, K., and Leyva Poveda, I., (2016), Characterization of Carbonate Mudrocks of the Jurassic Tuwaiq Mountain Formation, Jafurah Sub-Basin, Saudi Arabia: Implications for Unconventional Reservoir Potential Evaluation; Journal of Natural Gas Science and Engineering, vol. 33, p. 1-20. Hakami, A., Ellis, L., Al-Ramadan, K., and Abdelbagi, S., (2016). Mud gas isotope logging application for sweet spot identification in an unconventional shale gas play; A case study from Jurassic carbonate source rocks in Jafurah Sub-Basin, Saudi Arabia. Marin and Petroleum Geology 76, 133-174. Dr. Khalid initiated and led the American Association of Petroleum Geologists (AAPG) Student Chapter at Geosciences Department. Dr. Khalid was able to secure an exclusive sponsor to significantly fund extracurricular activities. This generous fund has enabled our students to conduct a wide range of activities, including international field excursions to Turkey, Denmark, and Spain between 2011 and 2017. 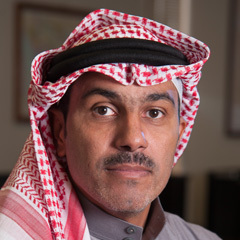 Also, as a faculty advisor of the KFUPM/AAPG student chapter, Dr. Khalid successfully supervised a team of BS and MS students that won the Imperial Barrel Award in the Middle East in 2010, 2012 and 2015. In 2010 and 2015, the KFUPM team won the third prize in the global contest in New Orleans and Denver, respectively. 2006 The best oral presentation in the 7th Middle East Geosciences Conference and Exhibition (GEO2006), 27-29 March, Bahrain. 2007 Junior faculty grant, KFUPM. 2007 British Council summer research grant; postdoctoral summer research at Cardiff University with Prof. Paul Wright. 2010 British Council summer research grant; post-doctoral summer research in University of Leeds. 2012 Best paper award in GEOS 2012 Conference, Singapore. 2013 British Council summer research grant; post-doctoral summer research in University of Leeds.